The Independent Garage Owners of North Carolina (IGONC) named Rep. Grier Martin their “Legislator of the Year” at their annual Automotive and Service Technology Expo in October. The award was presented in recognition of Martin’s “outstanding leadership and support of the North Carolina automotive aftermarket industry”. 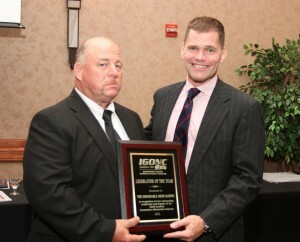 IGONC is the largest organization in the state that represents independent automotive repair and service businesses. Martin worked with IGONC on several legislative items. ”I am proud to have partnered with IGONC to meet the needs of their many members who operate small businesses throughout North Carolina,” Martin said. This entry was posted in Feature and tagged honors/awards. Bookmark the permalink. Post a comment or leave a trackback: Trackback URL.